Product review: Would highly recommend it – by Ady Colman, 24 Aug 15 5/5 Excellent "Phoned up spoke to the operator straight away then booked the flight no problems. We found it OK, directions were good, facilities were good, food and drink was a little costly. The staff was great no we did not feel rushed but they brought the flight forward due to weather. Would highly recommend it, all staff at Flights4all were great thanks. " On entering Duxford you will be amazed by the hundreds of aircraft on display, and you will be flying one of them. Make your way down to the Control Tower to meet your instructor who will talk you through the flight experience. He will show you around the aircraft, instruct you on the effects of each control and give you a final safety briefing before you both climb up into this large, powerful machine. The instructor will perform the take-off then demonstrate in the air how the controls work - then it's your turn! 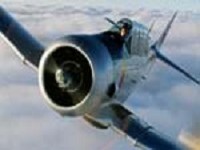 The speed and power of the T6 Harvard will give you a truly memorable flight experience. Flights take place on selected dates between March and October. Passengers must be generally fit and able to climb up into the cockpit. As this activity is weather dependent you must call the operator on the morning of the flight to ensure the weather is suitable. Any cancelled flights will be rebooked for an alternative date. There are currently 3 reviews of this experience. Write a review. There were no problems contacting the operator or arranging the date. Getting the venue was a long journey - 2 hour drive, M25!!!! The directions were okay and the facilities at the airfield were reasonable. The staff and equipment were all good. The staff were friendly, although I felt a little rushed in the briefing. I still felt confident and the staff were able to answer all my questions. The experience itself was GREAT, although I would have liked more warning before doing the loop !! Would love to do it again and would recommend it to anyone! There was plenty of time to take photographs and no rush to leave after the flight. It was arranged by my partner. We took a taxi to the aerodrome..The driver knew the way and dropped us directly in front of the right hangar. Catering, toilets other facilities are sufficent. We are Germans and not so familiar with the English language. We were surprised that the pilot took his time to talk with us about our intention to fly the Harvard and even private things. Conversation was calm and unrushed, and he gave us all time to relax a little bit and to reduce the excitement. The pilot continued with his calm style during the briefing. He explained all the essential instruments in the cockpit, told us how to strap into the seat and the procedure in case of emergency. Finally he told us about the commands "follow control", "give control" and "take control" as preparation to steer the aeroplane by the passenger. Of course everybody has his own imagination before such an event. I was not sure what would happen. Everything was possible. In Germany we have not got Warbirds and where we do have the regulations are restrictive - only a "cross-country" would be possible. But he (the pilot) offered us loops and rolls and did very narrow curves. The biggest surprise was the time to steer the aeroplane by yourself. My intention was to bank to port or starboard in a 90 degree curve and that's that. But it was possible to get control over minutes. That was wonderful. I enjoyed it so much! We had plenty of time to take photographs and film with the camera. Thanks to the pilot and his crew for the hospitality and special greetings to the tower crew. Phoned up spoke to the operator straight away then booked the flight no problems. We found it OK, directions were good, facilities were good, food and drink was a little costly. The staff was great no we did not feel rushed but they brought the flight forward due to weather. Would highly recommend it, all staff at Flights4all were great thanks.